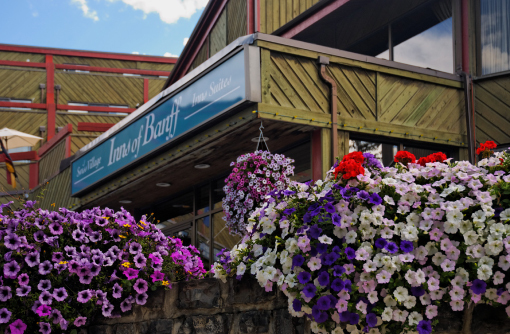 The Inns of Banff is located in Banff National Park with mountain views, wildlife and plenty of activities. This mountain hotel is a great escape to the Canadian Rockies. We offer hotel rooms, condo style accommodations, and a few cottages. Take a dip in our indoor pool, dine in one of our restaurants, explore a hiking trail in the area, or soak in the mountain views, all from the Inns of Banff. Let me tell you this, for a wedding they will bend over backwards and work with you and your price point to make your day extra special. The chefs food my guests still complement it and say it was the best and it was AMAZING. Yes, the rooms are old in one of the buildings but for the main building it was great. The service was excellent, the managers were really nice, and our wedding was flawless despite the rain. I loved every minute of it. The cascade terrace is beautiful! I would recommend anyone to book here cause the prices are about the same as the hotels in calgary if not cheaper. Love this place . We stayed here for the Santa Claus parade so it was very Christmasy !! & it’s only a ten minute walk to the town Center too..rooms & swimming pool/ hot tub are great !.restaurants conveniently located down stairs.. best value in my opinion. For the price the hotel was very suitable for our needs. Not perfect but clean with a very good bed and shower. Perfect location just by the first bus stop to take you to the skiing locations so always guaranteed a seat the busses always on time in fact everything ran smoothly throughout our stay. Hotel staff very friendly like all the Canadian locals that were a joy to meet. This hotel is a great price for good value. If you are looking for affordable accommodation that is clean then I would recommend here. It has large rooms and a pool with a restaurant on site. It is far to walk to the main part of downtown Banff but at the time we stayed your room key gave you free transportation on the local bus. We stayed at The Inns of Banff for one night travelling through. It was one of the cheapest options in Banff and it was nice enough. The room was large and the bed was comfy. The staff were very friendly and let us check in at 11am. The rooms were a little dated and the pool area needs a little work, including a lot less chlorine in the hot tub, but overall it was good value for money. I love Banff as a town and if you’re travelling on a budget it’s a good place to stop. This property is very unique as it’s built on a steep hillside. There are multiple buildings of rooms, but they are connected by indoor ped-ways. Each building has its own parking area so that you can park close to your room. Front desk check in was very friendly & quick. We had a room with 2 queens and it was very spacious with a large balcony & mountain views. Beds were very comfortable with nice warm comforters. This is an older property so it has a rustic feel. It is one of the best values in Banff. So yes, it’s not fancy & it’s dated. It’s on the edge of town so a far walk, especially if it’s cold, to restaurants and shops. But it’s priced accordingly & it comes with a roam bus pass to get you into the action of town! Won’t hesitate to stay again if the price continues to be right! Just spent 5 nights at the Inns of Banff. Very clean place to stay. Bus to downtown right across the street. Staff at the front desk amazing. Skiing at Louise and Sunshine amazing great snow and great hills for all levels. If your looking for a good deal and a clean place to stay, with staff that care, Inns of Banff won’t disappoint. If your looking for Luxury spend the money downtown. This hotel works and is a great property. Hotel was clean and price was perfect! Large hotel and you can get lost very easy! Outside hot tub was closed indefinitely which was a disappointment. Traveled with 2 dogs and pleasantly surprised in the room there was a doggie bed, 2 bowls for the dogs, a doggie toy and a treat bone! Very nice touch!! Thank you! We now travel with our Siberian husky pup & only a few Banff hotels accept dogs. We were very pleased with this place: as advertised dogs are welcomed here, with a giant dog bed, food bowls, treats & even a toy to keep, we all felt at home. Having become used to lesser quality “dog rooms”, this was a nice surprise, clean, spacious & had a mountain view balcony. The city of Banff has a terrific dog park located in the small industrial area (ask the hotel staff for directions) that is fenced & full of trees, the nicest dog park we have visited to date. Check this place out if you travel with a canine companion!